FEAR FACTORY Guitarist Dino Cazares On The Industrialist - "Me And Burton Decided To Take Control Of Creating The Record Ourselves"
GW: The previous album, Mechanize, was your first album since your return to the band. This one is coming out almost exactly two years after that. Would you say it was easier for you to write this one, because you've been with the band for a couple of years? Cazares: "Well, every project I worked on, I've tried to put as much as I possibly can. I dedicate myself to the project, and nothing really is too difficult for me. There are times where we go through small periods of writer's block, but for me, I don't really go through that too much. So it comes pretty quickly. Me and Burton started Fear Factory in 1999, so Fear Factory is in me. Every other band that I play in, you can hear my style, and you can hear Fear Factory in everything I do. So, this record was easy, not easier than the last record." GW: There were quite a few lead guitar parts and solos on the Mechanize album, which was something new for Fear Factory. This time, what was your songwriting approach? Cazares: "I believe the songwriting on this record is much more definitive of Fear Factory. Mechanize was a record on which Gene Hoglan was playing drums with us. There was a lot more of thrash element in certain parts of the album. But on this record, our approach was that we used a drum program on the computer. Basically, me and Burton decided to take control of creating the record ourselves, of course, with the help of Rhys Fulber, our producer. But in the beginning, we decided to do it ourselves so that it would be more of us, more of Fear Factory, and less thrash. A lot less guitar solos, but very ripping, very fast and hard-hitting. I think this record is more classic Fear Factory." The Industrialist is a conceptual record based around a story written by vocalist Burton C. Bell. The album’s artwork (below) was created by American designer Anthony Clarkson with additional direction from the band. 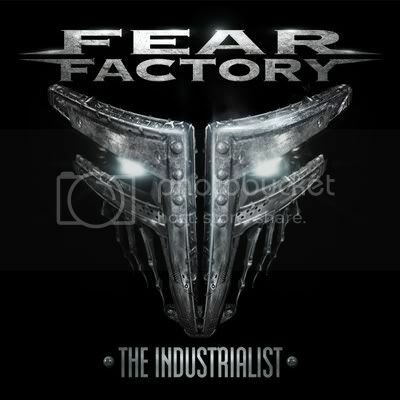 The Industrialist again pairs Fear Factory with producer Rhys Fulber. Mixed by Greg Reely (PARADISE LOST, MACHINE HEAD), with additional tracking by Logan Mader (GOJIRA, DIVINE HERESY), the album is the second written by Bell and guitarist Dino Cazares since reuniting in 2009 after a seven year split. The Industrialist follows the 2010 release of Mechanize. Widely regarded, the album was the first release from Fear Factory in six years. Mechanize debuted on Billboard’s Top 100 album chart week of release and topped CMJ’s Loud Rock radio chart as programmers embraced the band’s triumphant return.